Ranjit is a maths student at a University in Sri Lanka, where the high and lows of his life form a backdrop to his obsession with solving Fermat’s last theorem. As a backdrop to this are regular updates on the world’s steadily worsening news, a depressing state of affairs that has an effect not only on Ranjit but also on the Grand Galactics, a race of almost omnipotent beings who have taken it upon themselves to keep order in the Galaxy. As in so many other tales, they decide humanity needs to be wiped out. 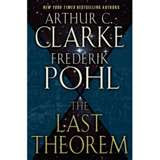 But what an endlessly entertaining tale Clarke and Pohl have woven out of these threads with a humour that reminded me of Pohl’s ‘Gateway’. It’s a story that often reminded me of other classic novels, but at the same time highlighted how those same themes can be used with verve and originality.